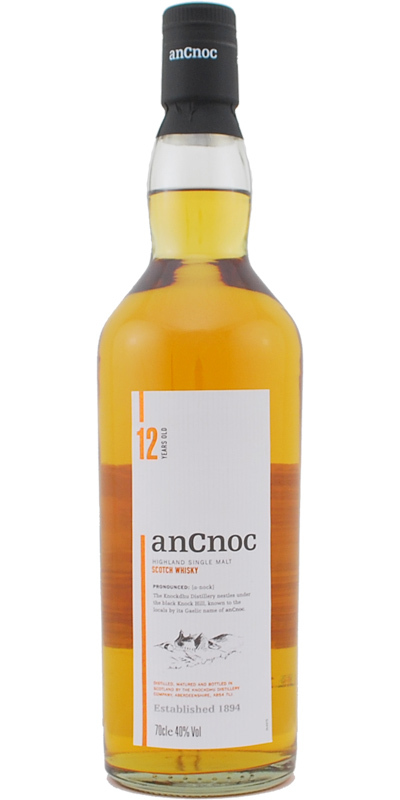 Distillery names can be a bit confusing: Knockdhu, Knockando - so let's just call this Single Malt anCnoc which is Gaelic for 'black hill'. Fruity acidity, sour berry mash and lemon zest are first to arrive on the nose, but there is a diverse mixture of fresh, floral and malty notes lurking in the back. The taste is spirit-driven, spicy and mildly dry with tropical fruits, heather honey and brown sugar. Just shy of medium length, the finish evolves with a touch of cinnamon, oak and licorice. A good 12-year-old entry-level malt which is flawless, easy-drinking and reliable. A very fruity and floral nose with marzipan, turkish delight and honey. The taste has honey, vanilla, turkish delight and a cane surgaryness to it. The finish is short with a mild and soft honied liquorice feel to it. I like it very well, not very outrageous, but really good drinkable without much TamTam. Medium length, spices and malt; clear oak; in the end, a nut-note will hang again. light fruit, light mineral notes, beautiful licorice notes, slightly dry, oaky finish. Easy Drinking, but with draft. Nice. Whisky has a light amber color. The color is excellent, I take into account that he passed the exposure in barrels from the bourbon of the second and third filling and barrels of Spanish oak. At the same time, caramel was not used as a dye. Whisky passed a cold filtration and was bottled at a commercial fortress of 40%, which of course is not good. The density is normal. With all its complex, interesting aroma, whisky has flaws in the flavor component, which makes its re-acquisition for 3000r (at a discount in the store "Aromatny Mir" in Moscow in August 2018 for 0.7) is inexpedient. The fragrance pleases its diversity, quite complex, although not saturated. Whisky in the glass takes time to open up to the proper extent, and your nose is a bit stiff. In the nose, peat, sea salt, leather, sulphurous iodine motifs are felt (although they are not bright, but this is quite unusual for Speyside). The brightest colors of yellow sour-sweet apples, duchesses, yeast dough, lemon, honey, cherry blossoms are further clearly felt. In taste, failure. It is flat and rustic, brightly malted. Salty for a split second, then sweet and bitter-sharp at the end. The same apples, honey, sweet citrus, grapefruit crust. At the end, it seems, comes to the fore a bitter peppermint and some kind of nutty. The average duration. Very warm, I would even say hot. Apple peel and bones, brewed cold black tea, a lot of black pepper, salted peanuts. Beats many other entry-level 12-year-olds. The minimum strength doesn't feel, the casks involved were nicely active, and a touch of leathery liquorice elevates what might otherwise have been a somewhat too middle-off-the-road, mainly ex-Bourbon-cask whisky into a higher stratum. Decent finish as well.